"Such overwhelming opposition sends a clear message to USDA that GE eucalyptus trees must be rejected–a message the agency can no longer ignore." Thanks for the promising news (grounds for legal action if USDA goes against it) Kathy! 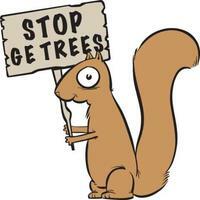 First I've heard of genetically engineered trees. Proves more people are becoming aware. Humans seem to be determined to ruin the planet. Let's hope that they now follow the people's wishes! I just dont know what they want to do with these trees. Perhaps good.